"INSPIRING A NEW GENERATION OF ATHLETES"
Double Down Athletics is Central Florida’s premier tumbling and recreational gymnastics facility. 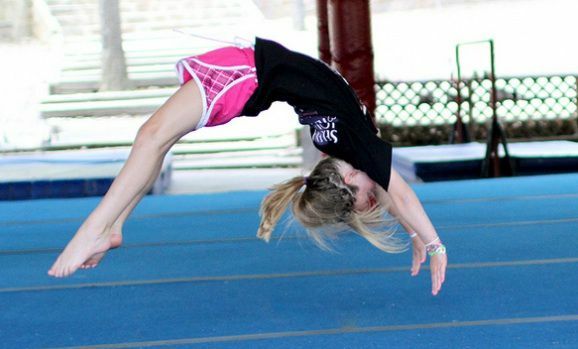 Our instructional program consists of multi-level recreational tumbling class. From levels 1-5 and ages 5 to 18 years old. Try a Trial class today for only $10! These classes are designed to be full of fun, music, games and exploring all the sport of gymnastics has to offer! Your children will explore events such as balance beam, bars, floor, vault, trampoline, rope, and more! Building self-confidence, body awareness, coordination and gross motor skills are an added bonus. While these classes are designed to be full of fun and lots of bouncing, we also focus on proper techniques and forms of gymnastics. Try a Trial class today for only $10! At Double Down Aerial Silks our main focus is incorporating fitness with fun. We train from the ground up to build the necessary strength to progress into more advance classes. If you have a dream of performing or just fitness this class is right for you. You work at your own pace and you will be flying before you know it. So take the next step whether you are a child, teen or adult.Try a Trial class today for only $10!